A father died protecting his children in a rare polar bear attack in Canada's northernmost territory of Nunavut. Aaron Gibbons, 31, was on Sentry Island, a popular fishing and hunting spot on the west coast of Hudson Bay, when he encountered the bear on 3 July. A relative said he "died a hero", telling his daughters to run while he put himself between them and the bear. The children were unharmed, but Mr Gibbons died in the attack. Another adult later shot and killed the bear. "He was enjoying his day with his children," Mr Gibbons's uncle Gordy Kidlapik told Canadian media. "They were surprised by a bear that had started to stalk or charge towards one of his children." One of the girls, who are described as primary school age, called for help through the boat's radio. "We actually heard the call for help," said Mr Kidlapik. "It was terrible to listen to." Mr Gibbons's death has shocked his hometown of Arviat, about 10km (6.2 miles) from the site of the attack, which has grown accustomed to seeing polar bears as they migrate north. "It's really just incredibly sad," said local lawmaker John Main on Canadian broadcaster CBC. "We're a small community and when something like this happens, it affects the whole community." With 380 polar bear sightings in the hamlet in 2017, the predominantly Inuit community has become increasingly concerned for public safety. The number of polar bears in the Western Hudson Bay region remains stable at around 840, according to polar bear experts. However, they have noted a decline in the animals' body size and condition. Polar bear excursions hosted in the region have also removed the wild animal's fear of humans, Mr Kidlapik alleged on Twitter, potentially resulting in more attacks on humans. 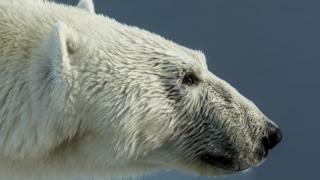 Polar bear video: Is it really the 'face of climate change'?